Save the manual in an Evernote note. Use that note’s unique URL to create a QR Code. Print that code on adhesive-backed printer paper. Affix the code sticker to the washer, drill, etc., for instant access to its manual. Bella Storage does a similar thing for storage totes but it reduces the number of steps and apps, and greatly enhances the result. The app, available for iPhones and Android, is the heart of the solution. When you’re putting items into a Bella storage bin, use it to note the contents, give the bin a name (“Halloween decorations,” “Summer clothes”, etc.) and give it a category, like “holiday” or “sports.” Lastly, add a location. Later, when you’re looking for that one swimsuit, the jack-o-lantern carving tools, or the bike helmets, Bella tells you what bin it’s in and where it is located. It works in the other direction, too. Simply walk up to a bin, scan the code on the side and “see” exactly what’s inside. You don’t need to pull it down and lift the lid. Of course, there are other solutions that offer something similar. Box Me Up works much the same, and has both a mobile-friendly, browser-based interface as well as an Android app. Another option is I.M Organized, which lets you inventory all of your stuff by simply scanning a bar code, and also generates QR Codes for you to affix to boxes or bins. Finally, there’s the DIY method I mentioned earlier. Good luck! Try out any of these apps for quick retrieval of your stuff. Happy storing! My grandfather’s garage was like a wizard’s lair. When I was a boy I knew that I could ride by bike to my grandparent’s house at any time and get something fixed. I’d hop off my bike at the base of the stairs, bound up to the porch, open the door and stride in like I owned the place (families don’t need to knock). After my grandmother gave me some warm 7Up in a tiny can, which I didn’t like but drank out of respect, I’d ask for my grandfather, who was in one of two places: the basement or the garage. The basement was an uninteresting place, full of the things that basements are full of. The garage, however, was something different entirely. Garlic hung drying from the ceiling. Toys my father had played with decades before dotted the walls, dusty and forgotten. It was quiet and dark as under-powered lightbulbs did the best they could. Along the far wall there was a pegboard on which hung every tool you could think of. That’s what I was after. The tools were neatly arranged, a magic marker outlining each space’s occupant. Nothing on the wall was new. Instead, this army of stalwarts had earned their spots on the pegboard through years of reliable service. Trouble with my bike? Fixed. Skateboard acting up? Fixed. Nuclear-powered rocket capable of reaching Earth orbit? OK not that, but my little-boy imagination thought it was possible. As I got older, the inevitable started to happen. What once appeared larger than life seemed to “shrink” and become more manageable, more real. Think of the time you returned to your old elementary school gym as an adult, or even a favorite public playground. “How did I ever think this place was big?” Eventually I learned that the massive collection of tools was really a set of nine useful, effective pieces of hardware that allowed granddad fix or repair almost anything. Today, those are the same nine tools I keep on hand. You might have project- or profession-specific additions, and that’s fine. For example, this list overlooks woodworking, an electrician’s tools and more. But as for a basic set of tools, you can’t go wrong with this collection. New home owners, college students in their first apartments or anyone looking to adopt a “handy” lifestyle, this is for you. A reliable hammer. A hammer can be used to drive nails, remove nails and start small demolition projects. Go for a 16-ounce model, as they’re the most versatile. While my grandfather had a hammer with a wooden handle, I’ve since opted for steel, as wood can split. The Estwing E3–16C is a fantastic choice for around twenty bucks. Screwdrivers. I bet you guessed that screwdriver would follow hammer. Phillips screwdrivers have been around since 1936, and their companion flatheads are also very much still in use. I also use the flatheads to open cans of paint, but I know that makes some people cringe. If that’s you, get one of these. In my experience, Wiha makes nice, precision-made screwdrivers with comfortable handles and fantastic overall build quality. The 30295 Screwdriver Set is a good one to own. You can get away with one Phillips and one flathead if budgeting is a concern, but you’ll be glad you have a selection of sizes if you can swing it. A tape measure. “Measure twice, cut once” is the adage that old-timers have passed down for generations. Since I’m better at the former, I make sure I have a good tape measure around to help me with the latter. I’m partial to the classic Stanley 25’ PowerLock because it’s the one my grandfather and I have seen take a lot of abuse like drops, falls, being smacked with a hammer…all without affecting performance. Plus, it gives a very satisfying “SNAP” when retracted. A crescent wrench. I have a love-hate relationship with crescent wrenches. On one hand, they replace a slew of other wrenches. On the other, I’ve experienced wobbly jaws that won’t hold their shape to the point of driving me crazy. I use a Channellock 8WCB WideAzz Adjustable Wrench. The lower jaw does not wobble around and, unlike many other models, it’s got a nice, comfortable handle. That’s precisely what you need when you’re wrenching down on a stubborn nut. And yes, you can use a wrench to drive in small nails, but please don’t. A cordless drill. Sure, you’ve got those nice screwdrivers but a drill can add/remove screws quickly and efficiently, as well as perform a whole number of additional tasks. Find one with multiple speeds and a reverse function. While you’re at it, pick up an extra battery that you can keep in the charger. It’s no fun to pick up the drill and discover that your only battery is dead, delaying your project by a couple of hours. I’m a Porter-Cable man myself, and the PCC606LA 20-Volt 1/2-Inch Lithium-Ion Drill is a very nice drill. A level. I know there are level apps for the iPhone and Android. I can almost see my grandfather rolling his eyes at those. Go out and get yourself a good, 24″ level. Remember the whole “measure twice, cut once” thing? This will help with that. A handsaw. My grandfather’s handsaw was like one of those that people play with a bow. They’re great, but I struggle with saws that cut on the “push” stroke. Maybe it’s my technique, but I always get hung up on the material being cut. The Shark 15″ Carpentry Saw cuts on the pull stroke, and I like it much better. It’s faster and more comfortable for the way I use a saw. Vise Grip. Behold, your extra set of hands. When you need both hands to work on something but a third to hold it still, the vise grips come into play. Here’s a quick note before you go out and assemble your collection. Don’t be afraid to spend a few dollars on quality tools. I’ve thrown away more junky screwdrivers than I care to admit. Also, Rome wasn’t built in a day so feel free to buy quality hardware a bit at a time, here and there. Soon enough you’ll have a pegboard worthy of a grandchild’s bike or skateboard. 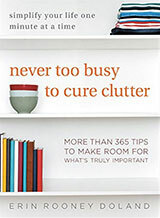 We’ve talked before about how to avoid clutter by careful purchasing. It isn’t always easy and sometimes it is downright difficult! Recently, I watched an episode of CBC Television’s Marketplace entitled, Retail tricks: How stores make you spend more which exposed some psychological tricks that retailers use to entice consumers to buy more and to increase their impulse purchases. Many of these persuasion tactics act on the consumer’s subconscious to coax them to buy at emotional level, bypassing logical, rational, decision-making process leading to increased spending. One of the strategies used to encourage spending is the Gruen effect. This is when consumers enter a shopping mall or store with an intentionally confusing design. They lose track of their original intentions and are more susceptible to making impulse buys. I’m sure anyone who has shopped in a large, wholesale-type store knows the feeling. The ambiance of the store also influences consumer purchases. “Easy-listening” music, free samples, wide and welcoming spaces all encourage consumers to slow their pace because spending more time in the store directly relates to spending more money in the store. Larger shopping carts and baskets encourage customers to buy more. Placing staples and lower cost items at the back of the store (e.g., milk in grocery stores) forces consumers to walk through many other aisles increasing their likelihood of purchasing premium products. Grouping items together at a marginally lower price such as 3 for $5 instead of $1.75 each influences consumers to buy three instead of just one. Limiting the number of items (for example, “limit of 6 per customer”) creates the illusion of scarcity and consumers tend to buy up to the limit. One of the most important ways to combat these tricks is to be aware of them. Learn to shop consciously. Avoid shopping when you’re tired, hungry, or pressed for time. Stick to your list and avoid those last-minute sales. If you’re interested in the psychology behind these retail tricks, watch the Marketplace episode. When I help people organize their paperwork, we usually come across stacks of receipts. Which ones are worth keeping? The following guidance applies to the U.S., but similar guidelines may apply elsewhere, too. If you bought a coffee at Starbucks, there’s no need to hold onto that receipt. You don’t even need to shred the receipt since it contains no personally identifying information that could cause problems if someone else saw it. You may want to keep those until you get your credit card bill/bank statement and can confirm the charges on the bill/statement match up to your receipts. These receipts can be useful for insurance purposes if you are unfortunate enough to have a theft, a fire, or other loss. Because paper records would get lost in a fire along with the items on the receipt, it’s good to keep these receipts electronically (with an offsite backup), in a safe deposit box, or in a fireproof safe in your home. If you’re not sure you want to keep something or if it’s an item under warranty, keeping the receipt until the end of the allowed return time or the end of the warranty period might be useful. If you itemize your deductions, you’ll want to keep receipts for any expenses you can deduct. And if you’re self-employed, there are many receipts that may be important. Check with your tax preparer (or review the information on the IRS website) to identify exactly which expenses are deductible and how long they should be kept. The Cohan rule may help you out if you lack receipts, allowing expenses to be estimated, but life will be much easier if you do have the receipts. If you own your home, keep the receipts for all home improvements. When you sell your home, the cost of those improvements will reduce your taxable gain. I have friends who are selling their house this year and didn’t keep good records for their many improvements, and now they need to scramble to pull the information together. That’s no fun. Cash register receipts printed on thermal paper fade over time. If you have some of those, scan them or make a photocopy as soon as possible, while the receipt is still legible. You may be able to scan such receipts and darken them after they’ve faded, but creating and saving legible copies right away will save you that bother. If a tax-related receipt doesn’t identify exactly what was purchased, writing that information on the receipt at the time of purchase will save you frustration in the future, as I have found from sad experience. Some stores offer the option of emailed receipts rather than printed receipts. If you deal well with electronic records, this can reduce the paper clutter. My grocery store offers emailed receipts, and I definitely prefer them to paper. 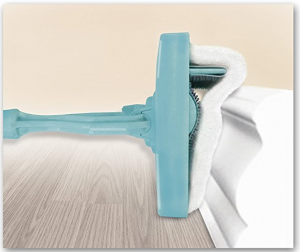 The Baseboard Buddy is designed to clean baseboards. At first glance, I agreed that this item was definitely a unitasker. It’s promotional video certainly has the same characteristics as many other unitaskers we’ve featured. However, the Baseboard Buddy has an extendable handle and 360° swivelling microfibre head that eliminates the need to get down on your hands and knees. It also will allow you to easily dust behind furniture. You can use it to dust crown moulding and the tops of door frames too. An independent reviewer has suggested that the Baseboard Buddy is rather flimsy for deep cleaning but this might be a useful tool if have reduced mobility and intricate baseboards that need regular dusting. Thanks to reader Spadlo for bringing this unitasker to our attention. Here at Unclutterer, we love Evernote. I’ve often called it “my external brain,” and consider it just that. I’ve used it to create a digital journal, manage recipes, and Erin has used it to organize her busy family life. Today I’ll talk about an oft-overlooked feature: the web clipper. 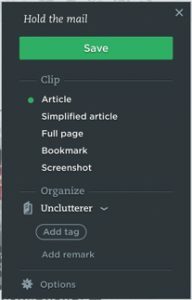 Evernote’s web clipper can be added on to your web browser to act as a useful go-between from the internet and Evernote. That is to say, it lets you quickly move information — links, articles, quotes, etc. — from a web browser to Evernote without requiring you to open the software. It’s fast and saves a lot of time. Today, I’ll show you the basics of using the Evernote web clipper. Go to evernote.com/webclipper to download the version your browser needs. You’ll be guided through the simple process. From there you’re ready to go. To do what, exactly? Let me explain. I’m using Safari for Mac in this article. While there will be slight variations across browsers and operating systems, everything will be largely the same. I often use Evernote to save online articles I’d like to read later. I can save the URL, open Evernote, find the appropriate notebook, create a new note and paste in the URL, but that’s too many steps. The web clipper makes it much easier. Article – Save the entire article as you see it. Simplified Article – Save just the text, stripping out ads and other non-essential images. Full Page – Grabs everything you see on that web page. Bookmark – Only grabs the URL. Screenshot – Takes a screenshot of the web page (or a portion thereof). Below that you’ll find the “Organize” section. From the drop-down menu, select the notebook you’d like to use as a destination. You can add tags and even “remarks” (brief notes to yourself) for future reference and context. It all takes a fraction of the time you’d spend by launching the software itself. This is a super cool feature. As soon as you click the little elephant, you may notice a little yellow square next to your cursor. This is the highlighter, and it lets you grab just a portion of the the text on a page. Simply click and drag to highlight it in yellow, then click Save on the Web Clipper. Once you’ve grabbed a clip, you might want to share it. After clicking Save as described above, you’ll be presented with a new window that offers to share what you’ve just saved. Click the drop-down menu for several options, including email, LinkedIn, Twitter, Facebook, Google Plus, and more. This is useful if you’re coordinating information for a family trip, group work project, and so on. This was just a brief overview and I hope it prompts you to check out this often-forgotten feature. It saves me a lot of time and lets me save a lot of great info I might otherwise forget. Winter always prompts me to clean and organize the car. I’ll add a good scraper for the snow and ice, a pair of gloves, a blanket and the next thing you know I’ve given it a complete overhaul. Here’s how I keep the cars tidy and uncluttered. I know this isn’t possible for many of you, but I like to keep the rear seats folded down. If you’ve got kids, this might not be an option. My wife drives a mini van that’s typically used to haul our offspring around, so my little two-door car is usually free of that duty. I keep the rear seats folded down for two reasons. First, it saves on wear and tear on the seats. Next, it expands the tiny “trunk” area (I have a hatchback, technically a trunk). That way if I have several bags of groceries or other space-hogging cargo to haul around, I can just put it inside without having to lower the seats first. Speaking of the trunk, those of you who actually have one, might want to invest in an organizer like this one from High Road Organizers. The compartments will keep most cargo from moving around as you drive, and the Velcro on the bottom keeps the organizer in place. If you don’t need it, the whole thing folds up and can be set aside. I also keep emergency equipment in the trunk. A nice kit like this contains flares, jumper cables, rain gear and more. It’s easy to overlook these kits but they are an important investment. With the trunk sorted, let’s move towards the front of the car. Those with kids will probably need a container of some sort for snacks, books, tissues, and so on. A portable shower organizer will work, as it can fit between seats. Some will suggest hanging an organizer on the back of the front seat, but I find that it just gets in the way of rear-seat passengers. I have one on each side of the car and I use them much more often than I thought I would. It is well worth the $10. Now, a few little tips to help you keep the car in tip-top shape. When you get gas, take a minute to toss trash. Empty tissue boxes make great car-sized trash bins. Put important papers like registration, service history, etc., in a small accordion binder. Keep a stash of zip-seal bags for cleaning up any number of things. It’s relatively easy to keep the car neat and tidy. For more on the topic, check out our articles on organizing the glove compartment and five things to keep in the car. On our post Becoming a more organized traveler, Maria, one of our readers, wrote us to say that she always has her postal mail delivery suspended when she goes on vacation. This is a great idea because if mail piles up in your mailbox advertising that you’re not home, it makes you a target for theft and identity fraud. Stay-cations. On a stay-cation you spend your days zooming around to attractions, restaurants, and treating your house like a hotel. Rather than have important mail get lost in all of the shuffle, have the post office hold it for you until guests have departed and you have returned to your regular mail processing routine. Special Occasions. Weddings, anniversary parties, and family reunions take time and effort to plan, attend, and especially host. Consider having mail delivery suspended from a few days before, until a few days after the event. When the event is over, you’ll have time to sort through your mail properly and you won’t accidentally send your payment for the electric bill enclosed in a thank-you card. Home Renovations. The house is being torn apart and work crews are everywhere. Mail can be easily lost (or stolen) in the tumult. Suspending mail delivery during this time may save you from losing important bills and payments. You can always pop-in to the post office and pick up your mail weekly if the renovations are over an extended period. Some people who travel regularly choose to rent a post office box and have all of their personal mail delivered there. They pick it up every week or so and process it all at the same time. Even if you don’t travel, this option might work for you depending on the quantity of mail you receive and the ease of visiting your post office box. Have you ever used a “hold-mail” service other than when going away on vacation? We’d love to hear how it worked for you. 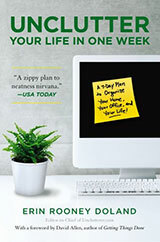 Is time management an idea that’s been oversold? Oliver Burkeman recently wrote an article in The Guardian entitled “Why time management is ruining our lives,” which raised a number of interesting points. Burkeman doesn’t seem to be writing about all time management strategies, but rather the obsession with productivity and getting as much done as possible in any given day, week, month, or year. One problem: When you get incredibly efficient, cramming ever more things into each day, you lose the slack time which allows new, creative ideas to emerge. Slack time also allows you to respond to unanticipated demands on your time. Burkeman wrote about how this plays out in the workplace and the doctor’s office (where that doctor’s focus on efficiency may cause you to wait way past your appointment time when an earlier appointment runs long). But the same need to deal with the unexpected can happen to any of us. I recently had a dear friend who was facing some medical issues, and I was glad that my schedule was not fully booked so I could readily be there to help her. I’d like to suggest an alternative: Inbox Whatever. As in, who cares? We might try to get more comfortable with not being as efficient as possible — with declining certain opportunities, disappointing certain people, and letting certain tasks go undone. Plenty of unpleasant chores are essential to survival. But others are not — we have just been conditioned to assume that they are. It isn’t compulsory to earn more money, achieve more goals, realise our potential on every dimension, or fit more in. I certainly want to be reasonably productive so I earn a decent living, serve my clients well, maintain key friendships, give back to my community, etc. But I’ve also decided that I’m not going to try to be a super-achiever, so I can also have time for things like lazing around in bed with my cats on a stormy winter day. At times we may all need to be that super-achiever for various reasons, and get as much done as possible. But it’s worth stepping back every once in a while to make sure we’re still making time management choices that work well for us. 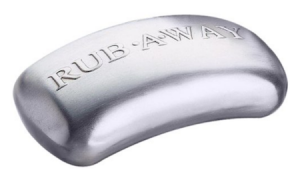 The Rub Away bar is a piece of stainless steel that resembles a bar of soap. It claims that you can remove odours (garlic, onions, fish, etc.) from your hands simply by rubbing them with this stainless steel bar. I’m not sure why you couldn’t just rub your hands on one of the other pieces of stainless steel already in your kitchen such as the sink, faucet, pots, pans, or cutlery to remove the odour – IF stainless steel actually removed odour. There have been no scientific studies to show that this actually anything more than an old wives’ tale. If you’re going to spend money on something that keeps odour from building up on your skin while cutting smelly foods, use soap and water. Regular washing will not only remove odour but also any dirt, oils, bacteria, and viruses – something that stainless steel won’t do. Thanks to our reader Deb for bringing this unitasker to our attention. In the world of retail, customer loyalty programs are designed to keep shoppers going back to the same store over and over. They often employ those little plastic “loyalty cards” that many of us have dangling from our key chains and cluttering up our wallets and purses. While the rewards can be nice, the cards are just one more thing to keep track of, carry around, or simply lose — unless you make them digital. Key Ring is an app for iPhone and Android devices that lets you store all of your loyalty cards on your phone. I’ve been using it on my Pixel and I have to say, it’s pretty darn handy. Plus, it let me seriously reduce the amount of clutter on my key chain and in my wallet, which I appreciate very much. Here’s a look at this clever little app. I’ve been using Key Ring on an Android device. The iPhone version, while generally the same, might have slight variations in functioning that are unique to iOS. Setup is simple. After installing the app, you’ll be prompted to create an account by adding your email address and a password. That’s it. From there, you can start adding loyalty card information. Adding a new card is just as easy. You’ll find a “+” at the top of the screen. Tap it, give the app permission to access your phone’s camera and take a picture of the bar code on your card. The app will recognize it right away and it’s ready to go. My hesitation with solutions like this is always the same. I’m always afraid that when asked for a loyalty card and I present my phone, I’ll get a confused look from the cashier. Or, the equipment the cashier has access to won’t accept a bar code that’s on my phone’s display. Fortunately, that has not been the case. I’ve had success at the grocery store, electronics store and elsewhere. Key Ring offers even more benefits than just storing cards and reducing key chain/wallet/purse clutter. 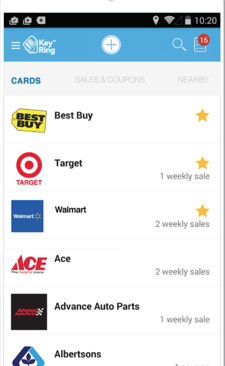 If you allow the app to have access to your location, it can find sales in the area, let you identify favorite sales for later reference, and even create shopping lists. You can browse store coupons and even have the cashier scan them, right from your phone. There’s no need to fumble with flyers and slips of paper. In the weeks that I’ve been using Key Ring, I’ve grown to love it. It’s well laid-out, simple and effective. Plus, it does exactly what it says on the label. My key chain can attest to that. How do you remind yourself to do something? As I sat down to write this week’s Unclutterer articles, my smartphone beeped a reminder, “Grace ballet at 12:00.” I was glad to receive the prompt and reflected on how crucial my smartphone has become when it comes to reminding me of what I need to do and where I need to be. Smartphones didn’t become commonplace until about ten years ago. However, I existed back then and I can’t recall the reminder system I used in the “dark days” before pocket-sized computers. I realize that not everyone favors electronic reminders that vibrate, beep and flash and that got me wondering. How do you remind yourself of what needs to be done? We’ve discussed many reminder systems over the last ten years . In 2010 we described a system that uses Google Calendar to prompt future action, and two years ago we pointed out a few ways to get things done while avoiding lists and reminders entirely. There are fantastic apps out there, too, like Due. I’d be lost without my smartphone when it comes to reminders. I’m curious, what is your chosen reminders system? Sound off!